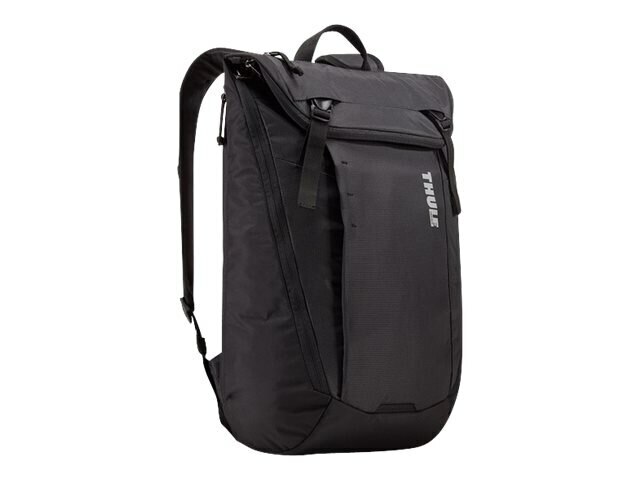 The Thule EnRoute Backpack is a 20L daypack with secure flap-style opening and dual access points to gear. Protect a 14" PC or 15" MacBook and 10" tablet in dedicated, padded slip pockets. Secure belongings in main compartment with flap-style opening that zips and buckles closed. Dual access to laptop, tablet and main compartment through top entry or side zippers. Quickly retrieve phone or small valuables in soft-lined pocket. Keep small items secure and accessible in internal mesh pockets. Attach extra gear onto hidden lash points on front panel. Easily store water bottle in mesh side pocket. Secure excess shoulder strap webbing out of the way with strap management system. Carry in comfort thanks to padded back panel with airflow channel. Laptop compartment dimensions: 13.7" x 9.8" x 1.1"